F. Scott Fitzgerald's The Great Gatsby occupies a preeminent place in American letters. Scholars have argued that Jay Gatsby is, in fact, the embodiment of American cultural and social aspiration. 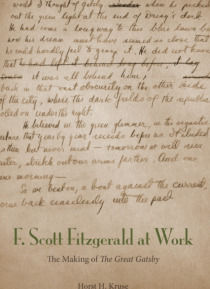 Though The Great Gatsby has been studied in detail since its publication, both readers and scholars have continued to speculate about Fitzgerald's sources of inspiration.�The essays in F. Scott Fitzgeral… d at Work examine fresh facts that illuminate the experiences and source materials upon which Fitzgerald based this quintessentially American masterpiece. They confirm author Horst Kruse's view that Fitzgerald's flights of fancy, even at their most spectacular, are firmly grounded in biographical experience as well as in the social, literary, and philosophical circumstances of his era.�In the first essay, Kruse reconstructs the life story of the individual who allegedly inspired the character of Jay Gatsby: Max von Gerlach. Kruse recounts his journeys to various archives and libraries in the United States as well as in Germany to unearth new facts about the genesis of the Gatsby characters. In another journey, readers travel with Kruse to Long Island to explore its physical and moral geography in relation to Fitzgerald, specifically the role of certain elite Long Island families in the advancement of the "e;science of eugenics"e; movement. The final two essays take Kruse across the globe to various destinations to consider the broader place of The Great Gatsby in American and international intellectual history.�Replete with fascinating discoveries and insights, F. Scott Fitzgerald at Work both corrects previous assumptions about The Great Gatsby and deepens our appreciation and understanding of Fitzgerald's imagination.